A few weeks ago I was at the mall shopping with my eldest. While she ducked in to Claire's for a peek at the jewelry, I stepped across the way into Babygap. As always, I was impressed by the sweet and classic clothing, but I didn't buy anything. I found myself picking everything up and saying, huh, I could totally make this. And it wouldn't cost me 30 bucks. This is why I rarely go the the mall. I usually leave with lots of ideas, but am frustrated knowing there really is no way I can make all that stuff unless we figure some way to stop time every so often so mama can get her sewing on in full-force. But I did see this skirt and knew it could happen really quick and on the cheap. With stash fabrics, no less. And it did. It's a simple fabric tube with elastic + casing at the top, and rows of pink tulle ruffled and then topstiched in rows across the top. 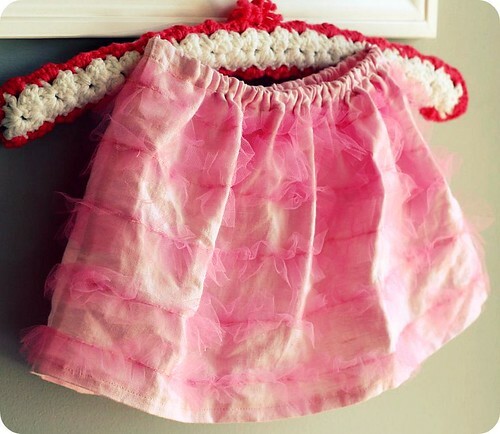 Ruffling tulle is easy, because it practically ruffles itself under a needle set to a longer stitch, so there was no gathering required. I kind of eyeballed the spaces in-between, too, so it's not perfect. No matter. It's a pink tulle princess dancing skirt -- who is really going to notice? Fidget spied it and immediately wanted to wear her new pink skirt on Monday. Which wasn't warm or sunny, but very cold and windy. And she was sick. She looked adorable at Urgent Care, though. (She's all better now, and back to preschool. What a nasty little cold that was!) The new skirt is now in the wash. Anyway, it's quick and painless and perfect for that little princess in your family. The skirt base: I made this skirt less full than usual -- the tulle makes it full enough. Wait to add the elastic at the end. The ruffles: The tulle strips are about 2" wide. I think I used a half yard, total. I attached all the tulle strips together before gathering, so it went quickly. I didn't worry about backstitching or anything. I made a long stitch (you'll have to experiment) down the middle of the strip and it gathered itself. At first I had it on 'basting' stitch, but it was actually too gathered. Attaching the ruffles: I started at the top of the skirt. When I got to the end of a row, I overlapped the ruffle a half inch, cut away, backstitched, and then eyeballed the next row and started sewing again. The ruffle really doesn't come undone. Oh no, Elise just spied this photo. Now I'm in trouble. :) It's very cute. Oooooo. I love! Fun twist on the typical Tule skirt. Thanks for the tutorial info too. I may be trying this! How cute is that? Especially with the boots and leggings!! Oh, Fidget! What a fun mama you have! I am TOTALLY making a few of these. You clever momma! Thanks so much! Now that my kids are napping, I went back and actually read your whole post...and couldn't agree more about your shopping mall thoughts. Like you, I find ideas spinning around in my head (especially as we sit at the mall toys and I have an hour to watch kids play - in cute clothes). We leave the mall and I have all this ambition to get to work once the kids go to bed. And then, it's 9pm and I'm tired. Oh, it would be fun though to sew their entire wardrobe all the time! very clever! I have to admit..being the tutu queen, and all...that we have a skirt like this...but I SO DID NOT make it. :) But, I'm bookmarking this..just in case the whim is catching! That's just ridiculously cute. Makes me want a girl, just so I can dress her! I have to say, I'm kind of hoping you've got a boy in there so those of us who are mamas to boys can see what you come up with. very cute! and I love how she's workin' it! That is so adorable! If my dd was still little and would still wear skirts I would totally have to try that. so, so cute. anna would love this. I have about four yards of tulle in my stash. i might have to make one for her! The last two sentences of your first paragraph together with the second paragraph -- I could have written that. That describes my thought process in children's clothing stores perfectly. Darling, darling skirt. I think I'm going to have to whip one out. So cute. Your's is much better than Gap's. Another cute skirt from Miss Chris. I think Spenser needs one. Oh goodness. I was going to try to clean house today... I will clearly be sewing now. Thanks for the idea and the how-to. I tried to do this today but mine didn't quite turn out. Do you sew down the middle of the tulle by itself first? And then sew the tulle to the skirt? I just sewed the tulle onto the skirt with a larger stitch length and it didn't gather very much. Do you have any advice please? I've love to make another one. WOW, it's gorgeous!!! Thanks so much for sharing this, I totally want to make one for myself! I'll be linking. Oh my goodness, yours is totally cuter than the "original". I can absolutely identify with your shopping style (i.e., "I could totally make this, and it wouldn't cost me $30!) It does get a little frustrating, though, doesn't it. What an adorable skirt. I should make one for my granddaughter. Your daughter looks so cute in it with her warm leggings. Thanks for the great post--love your site. I was wondering what to do with all the leftover tulle I had from my daughters Halloween costume. This is perfect. Thanks! Very cute! I wish my girl was little again. Ohhh, so adorable! My dd is going to go gaga for this! I'm so glad I have girls! Thanks for the tutorial! the right skirt for a little princess! It is lovely!! ... and ... what about the crochet hook: have you done it? OMGosh! That's way too cute! I made one last night! Not as cute as yours...but still cute! Thank you so much for the tutorial! Come check it out at: www.mamasamess.blogspot.com Happy Easter! How super cute is that! thanks for sharing and Happy Easter to you! Thanks for putting this on your blog. Your directions make it so easy. I feel like I sewed one just from reading this. And maybe I will sew one for real too. 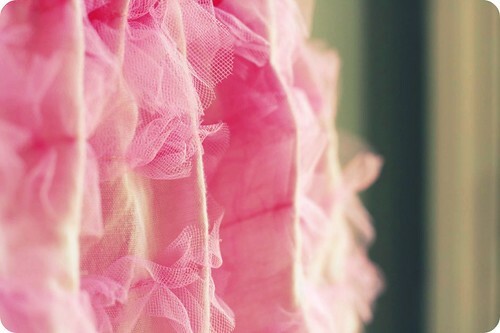 I always wanted a reason to buy some tulle but I never wanted to make a full skirt of it. This is the perfect answer. That is just the cutest! I just saw one of your creations on the sewinggossip blog! I am so impressed with all the sewing you are doing, even while expecting! ...I think I am going to have to make a "big girl" version! Thank you for sharing! This is darling!! And so easy. Thank you very much for sharing. My daughter just spied a skirt similar to this at H&M. Although I wouldn't buy it, I'd definitely make it. Thanks again!! Next time (yes, I am going to try again and agan! ), I will not be so ambitious and will use less fabric (I did not take your advice and made it extra poofy!). Combined it with The Polka Dot Chair's two-layer twirly skirt (did I mention I made it extra poofy?!). Fun stuff. Thanks! What a cutie!!!! i think my DD's wannna have both a tule skirt!!! i have to know where you got those boots! please tell me! I love this!! so adorable with the boots. I think I know what I'm making for the girly cousins for Christmas. Thanks so much! Okay, I know I am going to make this too cute skirt SOON. Two of them for my grand daughters. 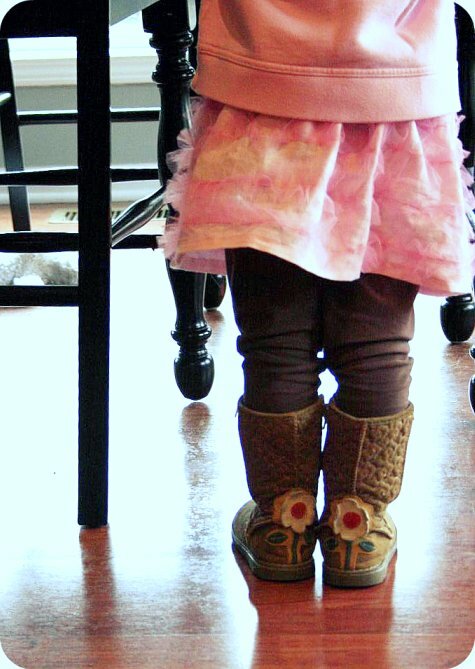 What I REALLY NEED to know is where you got the adorable boots...I have two grand daughters that NEED those boots!! You are terribly clever! I can't wait 'till I have a chance to make it. Where did you get your daughter's boots? They are too awesome from the back. Dare I ask for a shot of the front? Do you have a pattern for the skirt? I am new to blogging and reading blogs, but I cannot get away from yours! Last fall I found this tutorial for the adorable tulle skirt. I have made no less than 10 of them for my daughter and friends. Amazingly, I found my way back to your site and gaze at all your new wonders. Keep it up. I want to set aside thrifting day to hunt for treasures, too! I finally got a tulle skirt made for my daughter and she LOVES it. thanks for posting the idea with some directions! Now she wants a purple one, too!